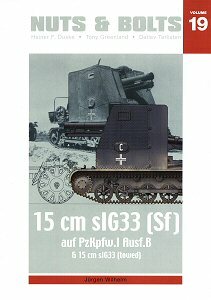 This latest volume on the 15cm sIG33 (sf) auf PzKpfw.I Ausf B from Nuts & Bolts sees a change in cover design but the detailed contents of previous volumes still remains with the text in both English and German for that main text and photo captions. This book is interesting in that there are no intact surviving examples of the Bison but only examples of the components such as Panzer IB and sIG33 on its ground mount nor is there an abundance of technical data on the vehicle so much of the book is taken up the details on the sIG33 15cm howitzer but there is still plenty on the Bison as it was a very noticeable vehicle due to the high profile and while there were not a lot produced it was well photographed in the field. The book starts with the usual introduction which mentions the lack of direct reference on the vehicle and then provides detailed text on the development history, technical data, performance figures and production numbers of the 15cm sIG 33 which highlights the differences in wheel design and other updates during the sIG33s production. This is followed by additional text with a brief development history, production numbers, crew, organisation and technical data on the 15cm schwere Infanteriegeschütz 33 auf Fahrgestell Panzer I (Geschützwagen (GW I) für s.I.G.33 (Bison I). This is followed by additional data on unit organization, service history, camouflage and markings, Nicknames and other markings as well as a detailed table with a summary of all the photos appearing in the book giving details on the Kompanie, Pz.Division, vehicle letter, nicknames applicable to each vehicle photo which is quite comprehensive. The text section of the book is finished with a detailed service history of s.I.G.Kp. (mot) 703 from February 1940 to its disbandment in August 1943 plus a Bibliography listing many references for the vehicle. The following pages 22 to 99 have many wartime photos of the Bison during the campaigns in the West, the Bulkans and in Russia with most of the photos being general type shots from the front quarters with a few from the rear but no real close up detail shots. The photos are organised to show shots of same vehicle and units together which does give a certain flow to the images and also helps show minor changes in markings and fittings of particular vehicles. While there are no real close-up shots this is offset by comprehensive and detailed photo captions on each photo highlighting certain details in the shots and of the circumstances where the photo was taken which is very informative. The photos also show the effect of local conditions on the paintwork as well as providing many excellent diorama ideas from open country to in major towns/cities with a few destroyed vehicles which do show some normally unseen details but the majority are of serviceable vehicles. The next four pages have large colour profile drawings of six different vehicles showing different paint schemes and markings which is followed by 5 view 1:35th plans with additional 1:35th plans showing the internal layout with a side view plan minus the side armour to show the sIG33 mounted on the Pz.IB chassis as well as a couple of line drawings showing the vehicle without the gun to show the rear deck and inside wall details which are very useful. The remainder of the book deals with the 15cm sIG33 Howitzer on its ground mount with pages 100 to 123 having many wartime photos of the gun in action with again detailed captions explaining the photos and show the gun during transport as well as in action with the crews positioned the gun and during the firing sequences for a good photo coverage of the gun. There are also some good shots of the gun being towed by different tractors such as Sd.Kfz.10s, 11s, 7s and 251s for some more good diorama potential. Following this are 4 view 1:35th plans of the sIG33 with additional plans with the different wheel styles used plus detail drawings of components such as the three different breech designs and the large trail arms. This is followed on pages 127 to 154 with a superb full colour walkaround on a museum sIG33 showing just about every detail there is on the gun in extreme close-up as well as shots of the 15cm Stielgranate 42 for one of the most complete photo essays on the gun you will find and will be invaluable for anyone building any of the available sIG33 kits from the basic Verlinden 1:35th and 1:16th efforts to those included in the recent Alan Bison kit. On the inside of the front and back covers are colour photos of a Tony Greenland model and while this was built quite few years ago and has a few errors due the lack of information at the time of building it is still a very detailed model that will be useful reference for anyone building the currently available kits. Another superb volume from the folks at Nuts & Bolts and while there isn’t any actual walkaround type photos of the Bison this is more than compensated for by the number of wartime photos with detailed captions and other details as well as the superb coverage of the 15cm sIG33 Howitzer on its own. Thanks to Heiner from Nuts & Bolts for the review book.